LOADER TRACTOR-AUTOS-FARM EQUIP-ATV-LAWN TRACTORS-TRAILERS-BOATS- SHOP & BARN ITEMS-HANDICAP RAMP-BEER ADVERTISING-ANTIQUES-HOUSEHOLD-ETC. Estate of Russell E. Rosebrough Marion Co. Probate Court Case #18EST0149. Russ retired from the Railroad, farmed and serviced Radio & TV’s in the 1960’s. A lot to sell ! LOADER TRACTOR-FARM ITEMS: JD 2550 dsl. 65 hp. utility tractor w/146 loader, 6’ bkt., 2 hyds, two-post rops w/canopy, 16.9-30 rears, only shows 1410 hrs., s.n. G535130; McDeering 8’ culti-packer; 3 pt. blade; JD hyd. cyl. ; IH fast hitch sickle bar mower; flatbed wagon w/metal sides on JD gear; David Bradley flatbed wagon w/wood sides and stenciling; (3) M.H. front weights; Clipper wood grain cleaner; Ford suitcase weight; 12’ feed auger; 3 hp. gas transfer pump; gravity fuel tank. ATV-LAWN TRACTORS-TRAILERS-LOG SPLITTER : Honda 200S 3 wheeler; (3) JD 318 lawn tractors; 50 gal. pull type sprayer; (3) 2 wheel trailers (5’ & 9’); New 22 x 11-10 turf tires; JD 10 tilt bed yard trailer; (2) pull type log splitters, 1-Speeco w/gas eng. ANTIQUES & COLLECTIBLES: Erie-Lack. s.s. water can; 26’ wood ext. ladders; (2) New Idea swath boards; milk can; Clydesdales Budweiser wood box; platform scales; Wayne Feeds “Tail Curlers Rockets” pig creep feeder; 10 wood apple crates; wood paned barn windows; copper boiler; prim. hand cart; old green paint wood house shutters; sev. rotary phones; xmas tree color wheel; wood River Bend lighted campground sign; a few metal toys; (2) 70’s Chevy pickup grills; steel wheelbarrow; (3) metal yard windmills; 1950’s tricycle; older car rims; Carl’s Auto Parts sign; (2) mantle clocks; 5 & 10 gal. crocks; 1950’s Kelvinator refrig. ; slaw cutter; cottage table; 5 gal. glass jug; oak sw ivel office chair; Spaulding Eliser Rodriguez catchers mitt; Toledo porc. 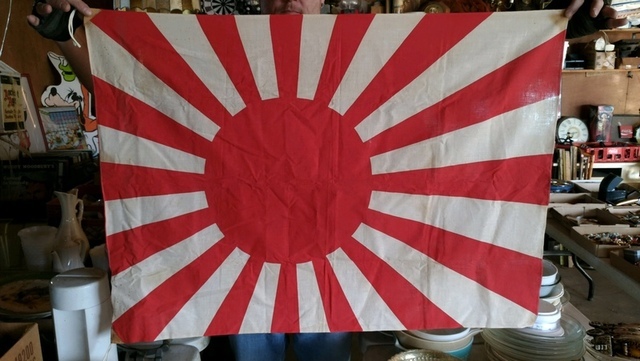 produce scales; set asst vintage stereo speakers and electronics; WWII Japanese Flag; etc.